Size • 64,400 sq. ft. The rebuilt Edgemont Elementary School replaces the oldest school in the District and is about 20,000 square feet larger than the original campus. Originally built for 500 students in 1956, it now serves approximately 700 students. 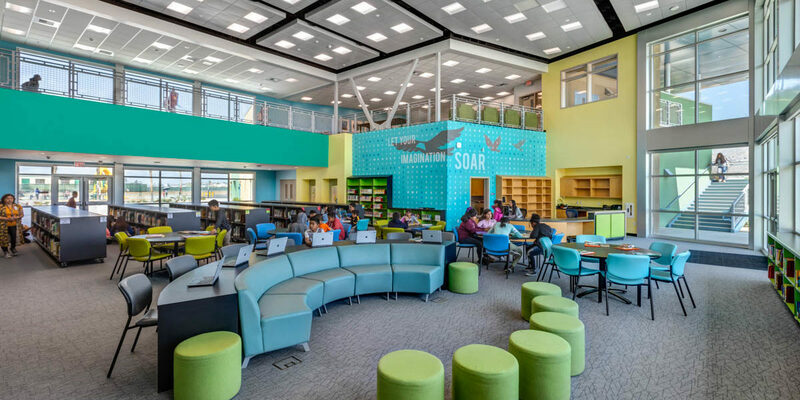 The new campus features a 30-classroom two-story main wing, stunning library, large multipurpose room with stage, and outdoor courtyards with spacious play areas. The interior hallways and library are painted in shades of blue, yellow and green creating bright and inviting spaces. The exterior features a modern look and carries the color scheme from the inside through to the outside of the school. The two-story design, which allows for more playground and play field space, is a first for elementary schools in the District.